WOW!!! Truly a very Unique and Luxurious Cabin with a natural and old theme. There is even a Large Real Tree Inside, supporting the stairs, a Huge 30' glass door opens to a large wood deck right by the 1st hole of the Golf Course and has a Babbling Brook running by. The setting is Spectacular with Unbelievable Near and Distant Views. Nothing was spared in the building of this luxury vacation home currently valued around $2 Million. There are 5 Fireplaces, 1 of these is strategically located in the master bath between the Master Jacuzzi Tub & Walk in Shower which has 10 shower heads! There are 2 BBQ Grills, 1 by the Creek & 1 BBQ Grill upstairs on the deck where you feel like you are sitting in a tree house, with a fireplace. It’s great for viewing the stars! The Cabin and the Landscaping were specifically designed to appear to have been there for many, many years. We even used 200+ Year Old Wood Beams throughout the interior for that rustic old world blend with modern luxuries. 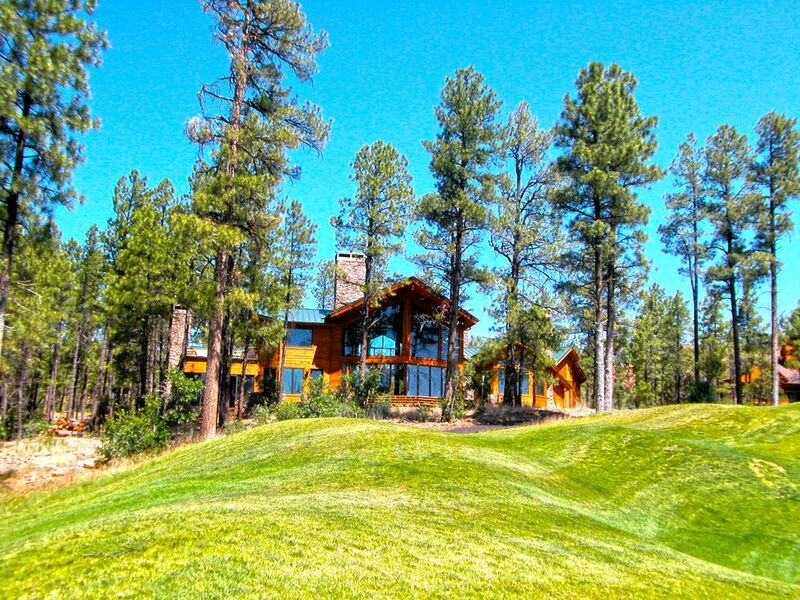 The views from every room in the cabin is spectacular and our lot has been referred to as one of if not the best lots in all of Torreon. The cabin has been specifically designed and laid out in order to take advantage of all of the views and looking across the Golf Course you will see a lake, a bridge and the 1st hole past the sand pit in the distance. This beautiful setting is framed by the view of millions of trees for miles and miles blocking the view of any other cabins behind us. The cabin is fully supplied and loaded with the latest appliances and a well stocked kitchen. There are also many games, both children and adults located in the cozy den with a truly unique ceiling. There’s even a secret play room upstairs with chalk and magnetic walls as well as another secret hidden room for your kids to find downstairs…. During the summer the babbling creek right next to the cabin is a running natural aquarium. Children love to wade in the creek and catch Crawl Dads, Frogs, Water Bugs and more, plus there’s always the fun of exploring and walking across the creek on the logs or jumping from rock to rock. The evenings are great time to play games, take walks or just roll down the hills on the golf course. Be sure to try the upstairs patio and watching all of the Shooting Stars go by or simply enjoy the peaceful night sounds with the gentle sound of the creek in the background while enjoying the fireplace and maybe barbecuing at the same time. During the winter months when the hills and trees are covered in snow you will find that some of the best sledding around is right outside our cabin. If the conditions are right you can go so far that you will have to stop yourself before you go into the lake!!!! There is plenty of room to make Snow Angels and Snow Men and to hang your wet clothes right in the garage before you come inside and make S’Mores and Roast Marshmallows over the fireplace by the kitchen and sip Hot Chocolate! Of course, World Class Skiing is only about 40 minutes away. There is so many great things to do and experience, but our favorite thing is simply to Relax, Slow Down and enjoy in the Cool Pines and Fresh Air…. So what are you waiting for? If you see the dates available on our calendar, get it today! Our busy season gets booked quickly, so don't wait! Most of all…. Have A Great Time!!!! UPDATE: We've recently included the option to utilize Torreon's Club Amenities. The Torreon Facilities include but are not limited to the pool area, the family center, and the fitness center. Look for the option to select the Social Unit Membership on our application form. The $50 transfer fee is not included in the quote unless added to a revised quote. This charge is typically billed separately. Please note the pool, family center, and other amenities are seasonal and NOT open year-round. Guests who visit from outside of the United States may incur a refundable deposit not to exceed 25% of the amount of their stay. Please inquire with any questions. The Cabin is located in a prime spot on hole #1 were you can watch golfers take their 2nd shots as well as sink their puts on the semi-distant but clearly visible green. Depending on were you are in the Cabin you can see the lakes in both the front and back of the Cabin. Across the golf course and other beautiful distant views you can see tree covered mountains. There is a creek that runs right by the Cabin and it is very relaxing to listen to. One extra space in the garage and plenty on the driveway. We have a transferable Social Membership available for an additional $50 that provides all the Torreon amenities minus golf. (2) Additional refrigerator located in the garage. The coffee maker is located in the kitchen near the refrigerator. We also have a blender and a magic bullet for use. We have spices and items available for all guests. All we ask is if you are the last to use it, kindly throw it away and replace if you feel generous! Plenty of dishes and utensils found in your average home. If you require special utensils, feel free to bring them! There is also plenty of condiments there for you to use. In addition to the dining inside, there are two tables for dining to enjoy the great outdoors. The first is on the deck outside and the second is upstairs near its own fireplace and bbq. The den has a few books to read. There are board games in the den cabinets. The upstairs chalk-board room has legos and other items to keep children occupied when inside the home. Often children like to play outside near the small running creek just outside. With the Social Unit Membership, you have access to Torreon's Family Fun Center (Seasonal) with video games, pool, and more! The upstairs Balcony has a fireplace, BBQ Grill, Table & Chairs and plenty of other seating. It is great for meals, socializing, star gazing or just getting some private alone time. (3) The back patio is huge and has great views. It is great for lunches, dinners or just enjoying the views and watching the golfers and wildlife. The Guest Room also has a deck that feels secluded but yet has golf course views. Truly a very Unique and Luxurious Cabin with a natural and old theme. There is even a Large Real Tree inside, supporting the stairs, a Huge 30' glass door opens to a large wood deck right by the 1st hole of the Golf Course. The setting is Spectacular with Unbelievable near and distant Views and a Babbling Brook running by. There are 4 Fire Places, 1 by the Master Jacuzzi Tub & Walk in Shower which has 10 shower heads, 1 BBQ Grill by the Creek & 1 BBQ Grill upstairs on a large Patio with a Fire Place. The Cabin and the Landscaping were specifically designed to appear to have been there for many, many years. We even used 200 Year Old Wood Beams throughout the interior. i only giving 3 stars because we had an issue with a toilet that was leaking a lot a water, gave the notice and no call back to let me know if someone was gonna fix it or not and some few little details that need attention. Other than that we really enjoyed staying there its cozy and the view is wonferful!! The pictures do not do this property any justice! So beautiful, quiet, and convenient. We will definitely be coming back. Beautiful property right on the golf course! Overall fantastic experience, easy to work with and straightforward instructions. Some minor wear around the property but nothing out of the ordinary. Very responsive and responsible hosts. Will definitely return. Easy to get to and very comfortable. Great place for us to get our adult kids and grandkids together for great family time. We loved our stay...amazing space upstairs for kids to play, great views and nice grill upstairs. The only real issue we had was getting the tvs to work to watch the basketball playoffs. Also...great playground just a short walk down the street. Such a beautiful cabin in a gorgeous setting. We had a fabulous time in this beautiful cabin with so many fine details. Ski: During the winter months when the hills and trees are covered in snow you will find that some of the best sledding around is right outside our cabin. If the conditions are right you can go so far that you will have to stop yourself before you go into the lake!!!! There is plenty of room to make Snow Angels and Snow Men and to hang your wet clothes right in the garage before you come inside and make S’Mores and Roast Marshmallows over the fireplace by the kitchen and sip Hot Chocolate! Of course, World Class Skiing is only about 40 minutes away. Off-Peak Dates are March 20 - May 31. Peak Dates are the rest of the time. We have a 2-night minimum stay requirement for non-holidays, and 3-night minimum stay requirement for holidays. The holiday dates shown are for example purposes only - can be altered as long as they are a 3-night minimum. Guests from outside of the U.S. will incur a refundable deposit not to exceed 25% of their stay.